Pastor Greg Laurie of The Harvest Christian Fellowship calls all Christians to evangelize to people who do not know Christ. The Harvest Christian Fellowship in Riverside, California yet again staged a SoCal Harvest Event, a mega gathering of faithful for three nights of prayers, fellowship and worship. What makes this gathering different from the others is that this is also a gathering where nonbelievers are brought by their believing friends with a hope that they will accept Jesus Christ into their lives. 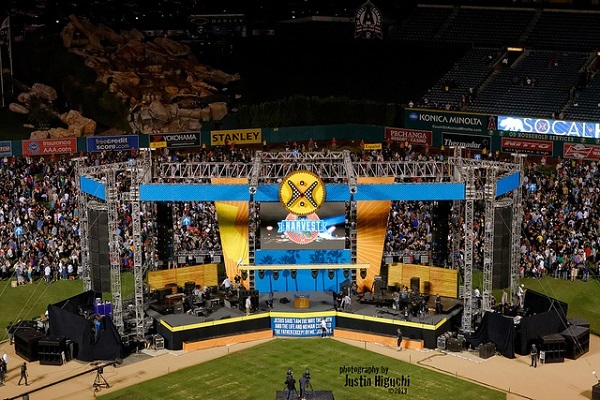 This year, over 100,000 people were estimated to have attended the services which was held at the Anaheim Stadium in California. The main aim of this annual mega event is to bring new converts to Christ. As such, it is an opportunity for the people of California to bring their friends and relatives to the three nights of singing and praying so that by listening to the Gospel preached in a way that connects well with the modern world, 'the seeds of belief will be sown into their lives'. The key preacher was Pastor Greg Laurie who delivered messages from the Bible to the gathering. Bible music performances were held by Christian artists like Chris Tomlin, KB, tobyMac, Skillet, for King & Country, Hollyn, Phil Wickham. Every year, Pastor Laurie gives a call to the Faithful to “Pray, Call and Bring” the people who do not know Christ to the event. He directs his congregation saying that the members need to first pray for the ones they want to bring, then invite them warmly. Pastor Laurie says that after the Harvest of 2015, 10,451 attendees accepted Christ. Now in its 27th year, nearly 470,000 attendees of the estimated 5.6 million have been converted. The organizers have said that the event was entirely free and no fee whatsoever was collected from those who attended. Pastor Laurie said that the aim of the event was to bring souls to Christ, and no impediment, no matter how small should stop those who want to attend the event from doing so. The pastors believe that every faithful member of the Christian family has a duty towards Evangelization. Citing the example of the Paul and of the struggles he underwent to bring people to the light of the Gospel, he says that the same duty lies on the shoulders of all Christians today. He urged the members of his congregation to 'go into the sphere of their influence' and try and bring as many people as they can.